Celebrate Valentine’s Day with OffGamers! Haven't gotten a sweetheart? Have Heretic Hilla sweep you off with her petite version! 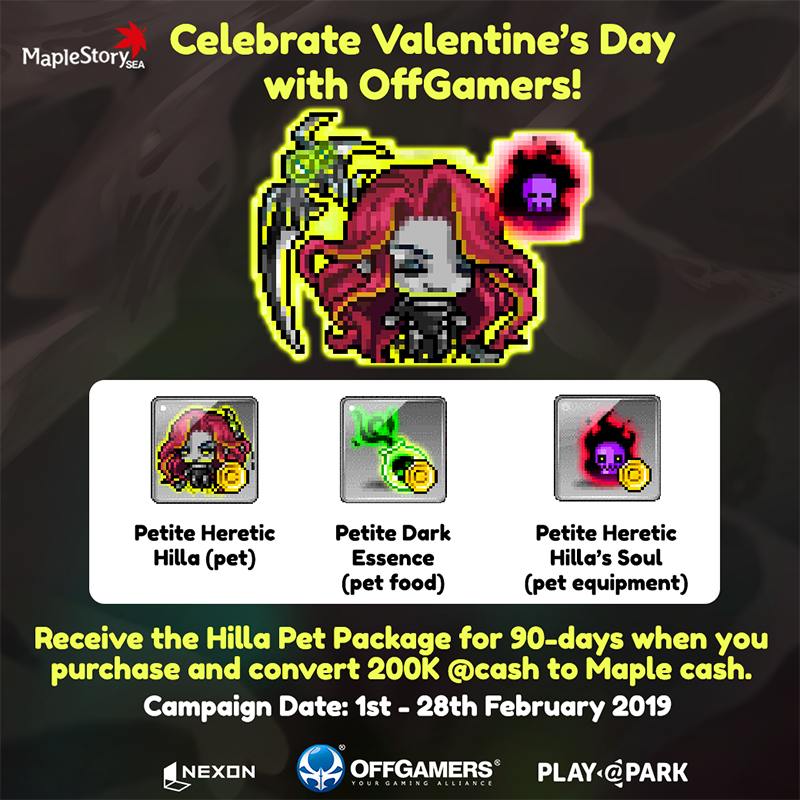 Simply purchase & top up 200k @cash denomination to receive a Hilla Pet Package! Note: Petite Heretic Hilla can receive the powers of the Water of Life. 3. Key in the 30-digit code inside the pop-up window shown below and click "OK"! Please note that the items will be credited to eligible players' accounts registered e-mail on a weekly basis. This Heretic Hilla is of no danger and isn't out to trap you in an endless labyrinth! Travel with her now! 1. Redemption Codes can ONLY be redeemed once. 2. Promotion is open to all OffGamers customers. 3. Please redeem the code before the coupon expiry date and utilize the item redeemed before the item's expiry date. 4. All coupons will expire on the 31st March 2019. 5. First 300 Customers to complete topup of 200K @Cash within the event period of 1st Feb - 28th Feb 2019 will qualify for the promotion. While Stocks Last! 6. All Charging & Conversion completed after the event date will NOT be entitled to receive the promotional item Hilla Pet Package. 7. Eligible winners will need to retrieve the redemption code from their Asiasoft Passport’s registered emails. 8. PlayPark Pte Ltd, Nexon Korea Corporation and participating partner will not be responsible for any loss of redemption code through lost mail, compromised email accounts and expired codes. 9. PlayPark Pte Ltd, Nexon Korea Corporation and participating partner reserves the rights to make any changes to the above stated promotion without any prior notice.